Apple on Monday began processing refunds for customers who recently purchased Workflow, an automation app the Cupertino tech giant acquired last month. 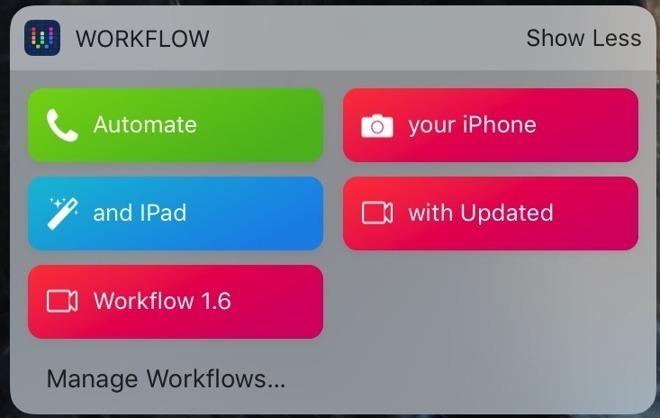 After making Workflow free to download, Apple is dishing out refunds to users who bought the app within the past few weeks. The cutoff point for reimbursement is unknown, and Apple simply refers to the eligible purchase timeline as "recently," as seen a copy of the email published by MacRumors. Thank you for purchasing Workflow by DeskConnect, Inc. Workflow is now available for free in the App Store. Since you recently purchased this app, we have issued you a full refund in the amount of $3.23. These funds will be applied to your original payment method and may take up to five business days from the issue date to post to your account. The move comes less than two weeks after Apple finalized a deal securing Workflow and its three-member development team in March. Like certain prior app acquisitions, namely Siri, the company will keep Workflow available on the iOS App Store as a free download. As AppleInsider noted, Apple's decision to maintain Workflow's App Store presence likely portends future integration into iOS. That said, the acquisition is not without its drawbacks, as Apple immediately trimmed compatibility with certain third-party apps including Pocket and Google's software suite. Workflow is available as a free 114MB download from the App Store.